At the intersection of mathematics, computer science, and philosophy, mathematical logic examines the power and limitations of formal mathematical thinking. 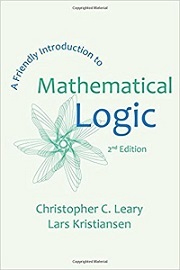 In this expansion of Leary's user-friendly 1st edition, readers with no previous study in the field are introduced to the basics of model theory, proof theory, and computability theory. The text is designed to be used either in an upper division undergraduate classroom, or for self study. Updating the 1st Edition's treatment of languages, structures, and deductions, leading to rigorous proofs of Gödel's First and Second Incompleteness Theorems, the expanded 2nd Edition includes a new introduction to incompleteness through computability as well as solutions to selected exercises. Christopher C. Leary, from Homewood, Illinois, was educated at Oberlin College and the University of Michigan, where he wrote his dissertation under the direction of Andreas Blass in 1985. He has held teaching positions at Oberlin, Stetson University, and at SUNY Geneseo, where he has been since 1992. A recipient of the SUNY Chancellor's Award for Excellence in Teaching and the MAA Seaway Section's Clarence F. Stephens Distinguished Teaching Award, he has published work in set theory and in mathematical biology. Lars Kristiansen is a professor of Informatics and Mathematics at University of Oslo.